SteelSeries' Arctis range embodies what many people now require from a gaming headset. It's stylish and portable, it can work with any normal audio source as well as your PC and it has a good, easy-to-use selection of features. It's available in three options, which are purely defined by features rather than quality. After a review the Arctis 3 is just an analogue headset that relies on software-based virtual surround sound from the SteelSeries driver; the Arctis 5 adds USB support, lighting and an audio mix dial, while the Arctis 7 adds wireless support. ​Whichever model you choose, you get the same styling and build quality, as well as the same microphone and 50mm headphone drivers. It's good, then, that the Arctis is a great looking headset. It's all clad in matt black, with a simple earcup shape, and a compact headband and arm mechanism - it could easily pass for a conventional set of headphones, until you turn on the lights. 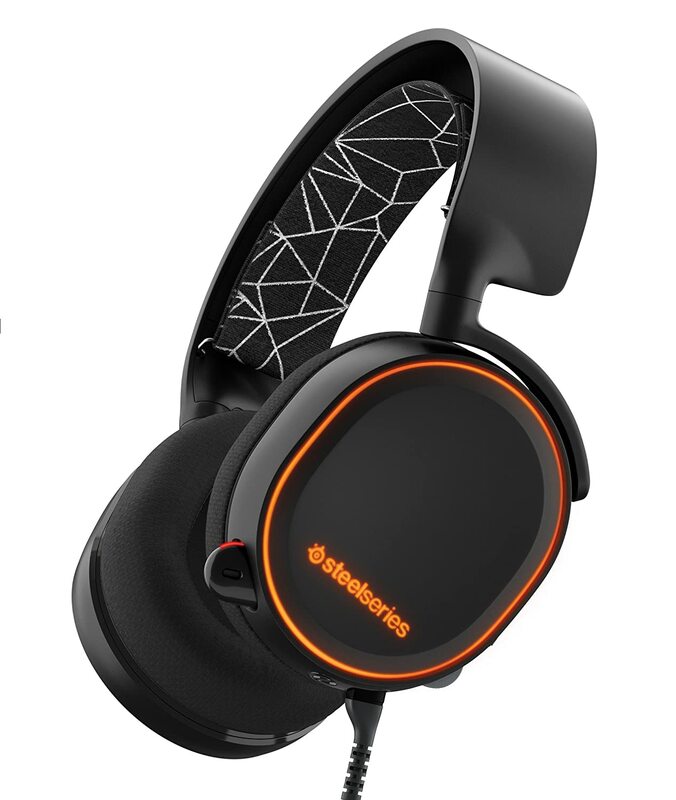 The Arctis 5 and 7 both include an illuminated SteelSeries logo, as well as illuminated strips that run around the edge of each earcup. If you're a fan of the current lighting trend, the Arctis 5 is attractive and well illuminated, but you can also turn it off if you prefer, or alternatively set it to one of the millions of colours it offers. In terms of features, the left earcup incorporates a pull-out, flexible, noise-cancelling microphone with an illuminated tip. There's also a volume wheel and mic-mute button, plus two features that none of the other headsets on test features: a removable cable and a 3.5mm jack input. This setup means you can easily replace broken cables, and also use the headset with a normal analogue audio source. ​You also have a choice of plugging the headset directly into your PC or using the USB mix dial. The headset shows as two audio devices on your PC, so you can assign different apps to each device. The dial then lets you mix between the two, which is ideal for game audio and chat audio. Fire up some music and the Arctis 5 provides a decent experience. It has a good bass kick without sounding forced, plus a warm mid-range and detailed high end. It's more balanced than the Razer in terms of sound, but not as detailed as the Asus. Switch to surround sound and it also performs very well. It can't compete with the Razer's adjustable positioning, nor the sheer directionality of the true surround options, but it's a good step up from stereo headsets. The SteelSeries Arctis 5 is a great all-rounder. It has a stylish design, good build quality, a useful feature set and solid audio performance, plus it's usable with conventional 3.5mm audio sources. The only problem is the price, which is a bit steep compared with the likes of Corsair's Void USB 7.1 - the Arctis 5 is a better headset. Next articlePicking the Best Motherboard for i5 6600k without Breaking the Bank?